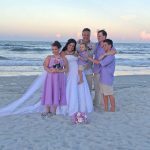 Aaron & Kristi were married at a beach wedding on the new deck at the Best Western Hotel & Suites in New Smyrna Beach, Florida on March 4th, 2017. Dare we say this beautiful couple was stunning! This was the first wedding ever on the this deck on the edge of the dunes facing the ocean! They also held their reception upstairs in the SeaScape restaurant! Best Western catered the food and supplied the bar & bartender. The couple hired a DJ and had a rockin dance floor after dinner. Publix supplied the wedding cake. They hired a wedding photographer as well. Aaron & Kristi chose the Sara two post bamboo arch and 50 resin white padded chairs, along with aisle way runner. They also hired Paradise Beach Weddings as wedding planner for the reception which included 3 additional 60″ round tables, 24 chairs, table centerpiece decor, and cake table setup.